I'm doing wedding makeup this weekend for my friend Kalee! She is one of my very best friends and I am so thrilled for her and Jonathan! Click here to see one of my recent vlogs with Kalee. She is hilarious, fun, and is going to be a beautiful bride! I'm honored to be part of the festivities as a bridesmaid and also to be doing her makeup. I've done her makeup many times, so I'm very familiar with what shades work for her... and while I'm not doing everyone's makeup- past experience has taught me that other members of the bridal party may will ask for help here and there. And it's my pleasure to assist! So that's why I'm bringing quite a few "extras" outside of what I'd use on Kalee. I'm using two of the bags recently featured in my Caboodles video. In the picture above, you can see the Tres Chic train case and the Envy polka dot bag by Caboodles. I have a much larger train case, but didn't feel like lugging it around, so I split my stuff into these two bags. The one thing you won't see packed that I'll also be taking is my brush set (they're freshly cleaned & drying) and will eventually go in the polka dot bag. The bulk of the makeup I'm taking is in this train case. As I mentioned in the Caboodles video, this is not the most durably constructed case in the world, but I'll be the only one handling it :) And for the amount of products I'm taking, it keeps them nicely organized. There is an open space in the bottom and three narrow trays on each side. I'm not really going to detail EVERY single product in there, but I'll mention some of the key things I like to take. On the left side of the kit, I have a bunch of eye products. Key things that have been VERY good for teary brides in the past have been the Mally Evercolor Automatic eyeliners, as well as Cover Girl Lash Blast Waterproof Mascara. I always use Too Faced Shadow Insurance in wedding situations, and I'm bringing along another neutral base- it's the Sigma cream shadow in Persuade. The second tray has a bunch of tools and lash/brow products. You never want to forget a lash curler, tweezers, and sharpeners! I also have some brow gel, lash glue, and the Sigma brow powder duo. Finally, the last tray is holding both of my Naked palettes. They provide a great selection of neutral shadows and fit easily in the kit! On the right side of the kit I have concealers, lip products, and some other random stuff. I packed a variety of concealers with varying textures and coverage levels. Some, like the Bare Minerals Stroke of Light are brightening, while the Sonia Kashuk palette and Laura Geller's Real Deal concealer are full coverage. As I said- I want to be prepared! :) In the second tray I have a variety of lip products- glosses, lipsticks, and lip liners. 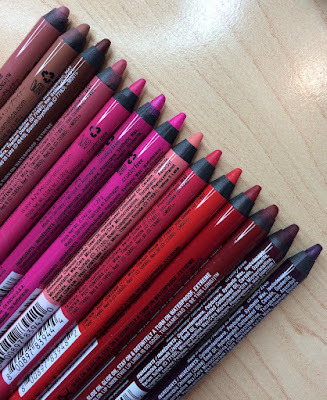 I really like the staying power and colors in the Milani Color Statement line, so I'm bringing several of those. The dresses are coral, so I'm going with a pretty natural look on the lips... kind of a "your lips but better" look. I have lip liners by Too Faced, NYX, and Jordana in the kit... I always find laying liners & lipsticks results in the best staying power. In the third tray I have some random things. That little NARS illuminator looks really pretty mixed in with body lotion. I also have some ELF blotting tissues, Maybelline Dream Bouncy Cream Blush in Hot Tamale, and a Nivea Lip Butter. The bottom of the kit holds skincare, primers, foundations, powders and bronzers. I'm bringing lots of shades (just in case), but a few key things include Revlon Colorstay Whipped Creme foundation, L'oreal True Match Pressed Powder, and Milani Multitasker powders. I also have a couple of great primers- Mally Perfect Prep primer and Smashbox Photofinish. I have a small size of one of my favorite semi-matte highlighting products in there too- it's the Laura Geller baked highlight in French Vanilla. It's very similar to the Wet n Wild Reserve Your Cabana. I was able to fit a few more palettes in the bottom part. For a full range of neutral matte colors, I wanted to have the LORAC Pro palette. I also have my IT Cosmetics My Sculpted Face palette with a variety of contouring colors, and my Coastal Scents blush palette. Those blushes are so nice and pigmented- and it saves me from throwing in a bunch of individual blush compacts! The polka dot bag holds a lot of extra supplies that just don't fit that great in the train case. I just LOVE this bag! I love how the little holders on the sides keep my bottles upright and there's still a lot of room to sit my brushes on top. I have a few different styles of false eyelashes- including my favorites, the Salon Perfect Demi Wispies! :) I'm all for spreading the joy of false lashes so I'm packing plenty!! My bottles! I have a little bottle of alcohol to sanitize makeup and tools, my on-the-go brush cleanser spray, Urban Decay All Nighter Setting Spray, some Cocoa Butter lotion, and the RCK Body Glow... it's gorgeous! I'm not doing any hair (except my own) for the wedding, but who doesn't need a little extra hairspray before the big moment? I have my trusty Tresemme Tres Two. There's a little mesh pocked inside the polka dot bag where I'm keeping tissues, Neutrogena makeup remover wipes, Wet Ones, and a couple of snacks if anyone needs them! Finally- the emergency kit. This is something I first got together for my Wedding Day Touch Up Kit video, and I've added to it since then. This bag contains a bunch of handy things- like disposable Wisp toothbrushes, a Tide pen, Excedrin, deodorant, mints, earring backs, a sewing kit, floss, and more. This has come in VERY handy over the years! I hope you enjoyed this post! And if you want more wedding-related makeup information, I have a bunch of videos on my Bridal Beauty Playlist on YouTube! 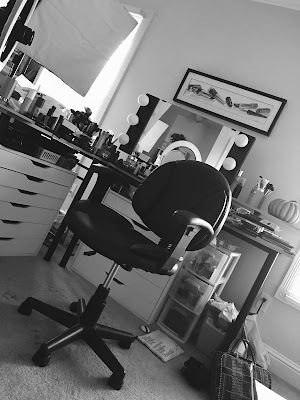 I also did this blog post about a year ago when I did makeup for my friend Katie's wedding. That day I did makeup for 8 people, and in the blog I talk about what worked and what I would do differently. In a nutshell, I'd encourage anyone doing wedding makeup to be prepared! :) Chances are there will be some nerves on the big day, so in addition to doing makeup, I try to take it upon myself to put the bride at ease and help her feel relaxed. Even if YOU feel nervous about doing makeup, sometimes you gotta fake it 'til you make it! :) The more prepared and organized you are, the more you can enjoy yourself and have fun with the process. Thanks for checking out this post, and I hope everyone has a safe Memorial Day weekend! In case you missed Beauty Broadcast Live this morning- here's the link! I also just posted a new Color Lovers video on Rose Gold makeup! Been drinking green tea all afternoon... and making frequent trips to the bathroom. Isn't it mind boggling how quickly guys can pack? Tyler hasn't even started, and I know when he does, it'll probably take no more than 5 minutes. You know what's funny, I feel like somtimes my boyfriend takes longer than me because he can't make up his mind on what to bring clothing wise. I think it's funny until I pack and get everything nice and neat only to realize half the bag is full of makeup haha! Also, you're beautiful! Absolutely my favorite guru on Youtube. Ignore those tacky comments! I still can't get over how much those cases can hold! So many products there. Thanks for letting us take a peek inside what you bring with you! I've always loved this idea. Some great items you'd never think of packing for the big day but that end up coming in very handy. And you look great, as always! I think I commented on one of your more recent videos asking if you'd lost weight - it shows. You've always looked great though! Do not let negitive comments get to you! Hav a great weekend! Hey there. Just thought I'd suggest baby wipes asan option for those with sensitive skin. I don't know about Neutrogenia original wipes but the pink ones irritated me, and I don't usually have a reaction to wipes. But baby wipes are cheap and great for removing eye make up for touch ups. And as a mom, I always have wipes on hand. Lol. Wow that train case does hold a lot of products! I really wish in the future you could do my wedding makeup, that would be a stress reliever for any bride, you are the best! Going to go watch your new color lovers video right now, rose gold is my obsession!! I'm overweight BIG TIME AND IT MAKES ME CHUCKLE to think of anyone hinting that you are. I think you look great. I love this video and have an emergency bag like that. I have safety pins in mine. They have been a life saver more than once. Bridal Makeup is one of the most fun events to do in my opinion. The craziness, the love, the sometimes bonkers Bridesmaids! Never a dull moment! Have fun, I'm sure everyone will be gorgeous! Emily, I am a huge fan. I watch your videos all of the time and check in a lot to your blogs. I'm sure you get this a lot but you are great at what you do and such an inspiration. This world is full of ignorant, uneducated, immature individuals who do not think before they speak. You are stunning beyond words, in and out. Sad others will miss out due to their ignorance. Team Emily! Oh wow, you are one prepared lady! Seeing you so organized would put me at ease instantly if I was the bride, what a lot of thought must have gone into that. She is very very lucky to have you as a friend, and with her on that special day. All the best & enjoy! Wonderful post! I've had some friends (maybe jokingly) ask if I'd do their makeup but I'm just getting comfortable doing my own. Just curious if the foundations you take in your wedding kit are all foundations matched to your skin tone? How do you blend / make it work for the brides / bridesmaids if they're not of your coloring? Or, do you find that between the various brands of foundations you have, you're able to find a match for them? You said it! Thank you. Just wanted to mention I have that exact same train case only in a different color.. and I've had it for eight years and it's still in perfect condition. I really gave it a lot of use for several years too, traveling extensively with my husbands work where we were on the road for 2-3 weeks a month. It's a good one. The only weak point I've found is the lock.. My dd has an identical one and the keys are a joke.. but I never lock mine so it hasn't been an issue. I'm a very similar body shape to you.. short and curvy. I'm exactly the weight I should be according to my doctor, and it's taken me a while to get comfortable with my shape because I starved myself for a long time to get that "slim" form those tall, long legged girls have. I just got tired of fighting my body all the time. I think you look great.. don't listen to nasty comments. So many of them are just sad or angry people taking their pain out on others. People are just ill mannered along with insecure, so they like to make digs at other people. It says a lot more about their character than it does about you to make a snarky comment like that. You're awesome, and gorgeous, always. You rock! Love this post. Very informative!! I really like the emergency kit. I think ill do something like that when I travel!. Also where did you get your poka dot bag I love to have a bag like that. Love your blog Emily!! 1. "Those" people are rude and should be muted. That is all! :) Keep the amazing videos and reviews coming!! Hi Emily. Is your "on-the-go brush cleaner spray" DIY or have you just rebottled a store-bought product? I love the "wedding day touch up kit" idea! I'll pass this on to my cousin, who gets married next month! Wow, your makeup kits are so organized and detailed. It's great seeing a peek inside what you prepared. Can you do a video on how you sanitize your products before and after each guest? I've been looking EVERYWHERE for that caboodles polka dot bag. Where did you find it? This makeup kit is looking nice and I would like to tell that I have recently found a site which is providing various types of makeup kit and it is very easy to use. This is one amongst my desired blogs; I have got enough knowledge through this. The piece of writing has really allured me, nice try! Whoopee! After a long wait I got this site and I got the important facts as regards my study and familiarity from there. pengobatan kutil kelamin obat kutil kelamin alami Obat kutil pada kelamin pria obat kutil di kemaluan obat kutil kelamin pada wanita penyakit sipilis pada wanita obat penyakit sipilis pada wanita penyakit sipilis pada pria obat sipilis pada pria obat penyakit sipilis pada pria penyakit sipilis obat penyakit sipilis penyakit sipilis pada pria obat penyakit sipilis pada pria obat sipilis resep dokter obat penyakit sipilis raja singa obat sipilis obat penyakit sipilis obat sipilis di apotek nanah keluar dari kemaluan obat kemaluan keluar nanah"
Nice kit. I bet there is far more than a couple of thousand of dollars in it. I have a friend who is a stylist at wedding salon http://elstile.com/ and she told me that they spend a lot of money to get the right stuff. You must be great at make up. Good luck with that. Have to do a smooth video calling. The audio how to facetime without wifi running by the side of your video conversation. After that, you could share the video clips and also enjoy. Musically video clips could be shared from your tool. You can start with musical.Ly login from any kind of sort of system comfortably. musically.wiki afterwards ensure you should check your username as well as password. This head collar harness slides right Dog Harness Reviews over your dog's nose to supply immediate Visit here control while out as well as around.